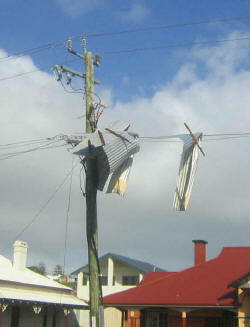 The Dept of Energy Safety inspected my 'shed' on Nov 21, 2003. My equipment runs from 50 V AC to make it pass the Western Australian requirements. Higher voltages require a qualified electrician unless they are 'downstream' of the 50 V AC. 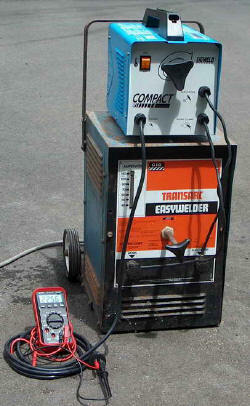 This is provided by an arc welder stepping down the 240 V AC mains to 50 V AC (120 A peak). The 50 V AC is then stepped up (by another arc welder wired in reverse) to 240 V AC again. Actually 225 V with losses. Various projects then raise this voltage a lot further. Assume that all home made mains equipment described runs from this arrangement. Note that this is no safer, just legal or rather not covered well by existing laws. Are the basis of science but I have been slowly improving my equipment with an analogue storage CRO and a Rogowski coil current meter which have proved invaluable in catching the transients high current with discharging capacitors. I have kept most measurements in inches and feet etc rather than our metric units for the benefit of US coilers. And yes we do spell aluminium like that in Australia. I was looking for a way to measure milligram (0.001 g) weights using a cheap digital scale with 0.01 g resolution and have set up a lever with 10:1 ratio on it with one end as the fulcrum, scales near fulcrum and weighing point at the other. The auto zero (tare) will compensate for the lever weight and if the dimensions are right the scale should be accurate without calibration required. 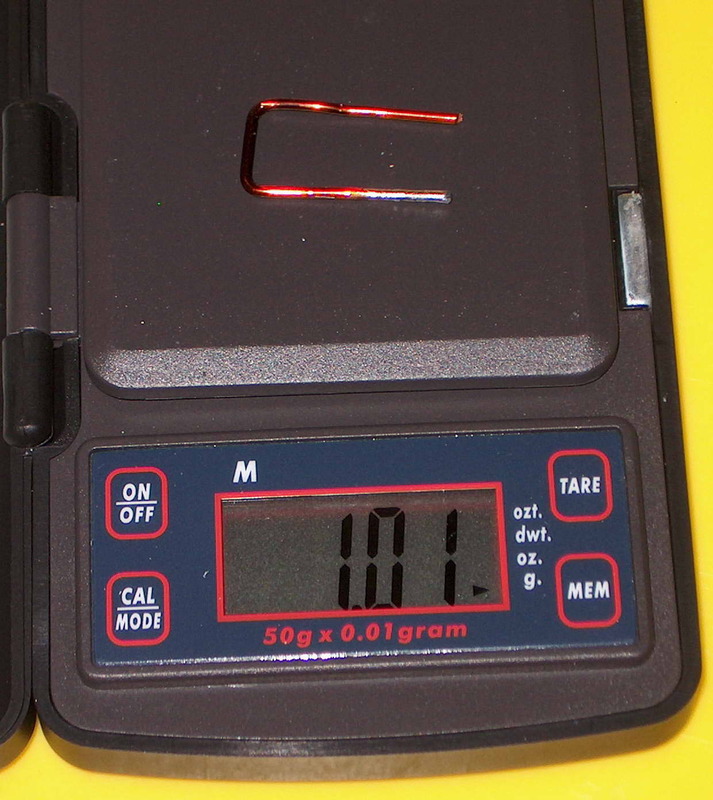 Picture shows wire weighing 1.01 g on balance reading 11.06 g (which divided by 10 gives 1.106 g). 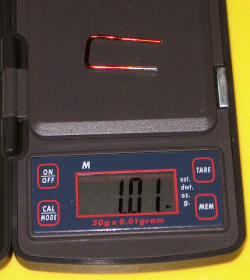 Only 10% error and reads to 0.001 g. The drop of water from a 29 G needle weighs 5 mg +/-1 mg on these scales. The drop size average dimension is 2.04 mm = 1.02 mm radius. Using the formula 4/3 pi r^3 for volume of a sphere gives 4.4 mm^3 = 4.4 mg which is close enough to the measured 5mg. If you look closely beneath the hanging drop you can see the streak from the drop where it fell during the shot. 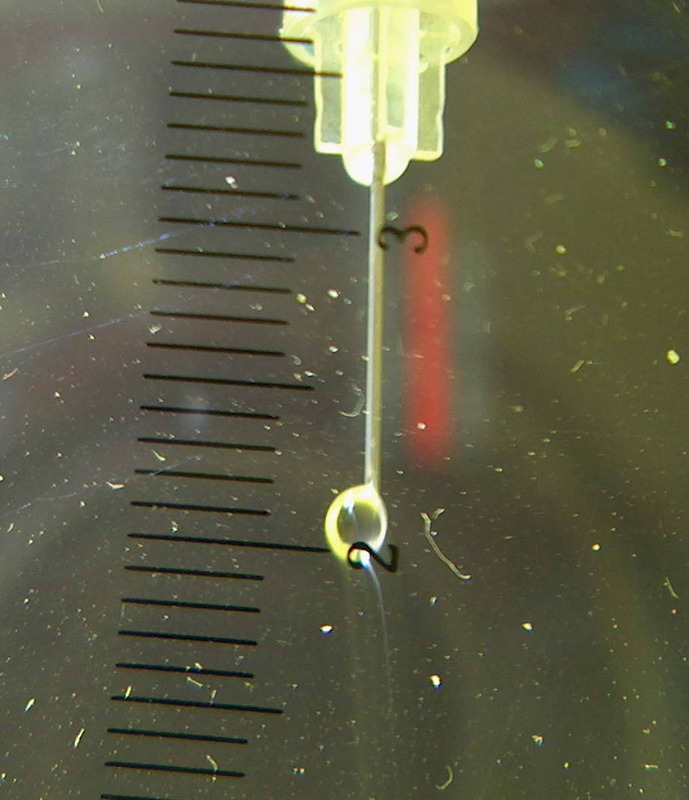 The streak goes towards the axis of the needle as the drop slides off the bevel but remains in contact with the tip. 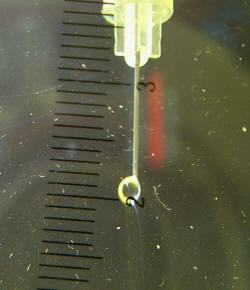 Hence this shows a full size drop, not a partly filled one which is why this picture was chosen to do measurements on. For discussion of this topic on the 4HV forum click here. Think carefully before you buy a camera. A good proportion of my website success has been the ability able to take long exposure, low light photos with a digital SLR (That's one of those bigger old fashioned looking camera's which is digital and can have screw on interchangeable lenses). I could not have done many of my shots with my other point and shoot cameras. 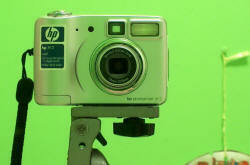 It's not just the pixels, in fact 90% of the time people only see less than a 1MP photo (camera is 6MP). Without the manual exposure option I would not have been able to take 3 of my top 4 photos and this more than anything sets my site apart from others. I was fortunate enough to win it and otherwise would not have had the opportunities that I have had. I would buy a DSLR second hand rather than a new point and shoot if the money was the same. 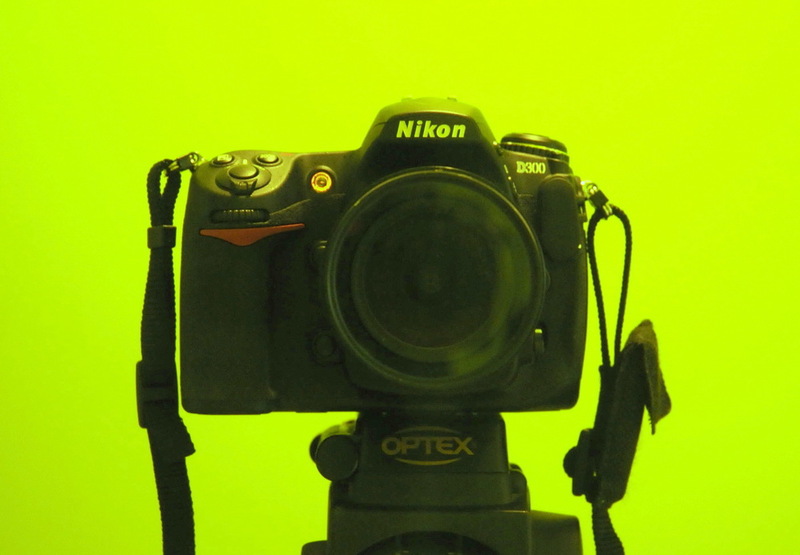 My current camera is a Nikon D300, but that's not important as it's the manual/long exposure option and better low light capability that matters to me. 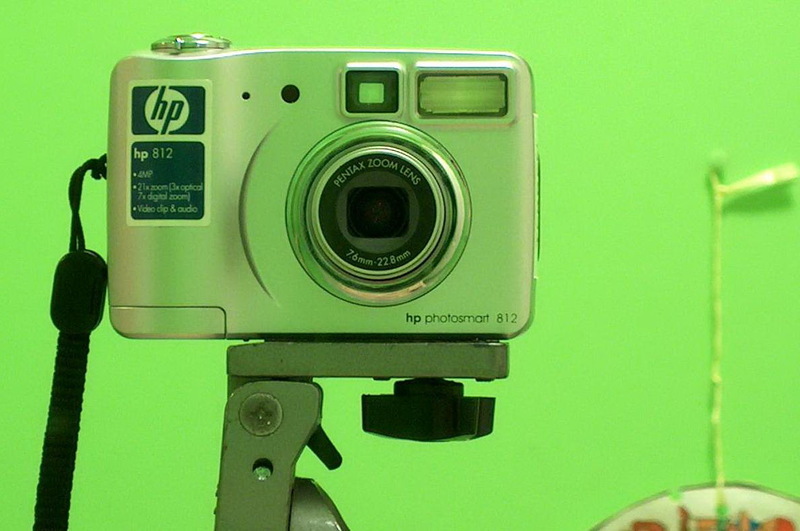 Shown above from around 2003 is a HP 812 4 mega pixel digital camera with tripod for estimated 10 second exposures from what my wife regards as a safe distance. (There is not inconsiderable risk to electronic devices and some of the close up photos were taken with the camera wrapped in aluminium foil). MPEG video on website also taken with same camera. It can even take a picture of itself! (in a mirror on auto timer in a green room). I have a custom made tinplate box which can cover this camera or my Nikon 501 or Sony digital video camera which allows them to be used more safely with a tripod closed to the action. After June 2005 I have used this Ricoh Caprilo 5MP camera. It is much better from many points of view including macros focusing down to 1 cm from the lens. I didn't get to use it for long. This is my Nikon D70s 6 MP camera won as a prize in August 2005 in our local paper photo competition (Sunday Times circ 365,000). Camera was valued at AUD$2000 with lens. The competition had 5000 entries in 2 categories with 40 photos published in each and I won one of them. The photo I entered was the Tesla coil with 7 foot sparks. The camera has a bit of a learning curve but has much better low light capability (to ISO 1600). I have accessories including a tripod (essential), normal and long distance IR remote controls and lenses including a Sigma 180 mm that does 1:1 macros (from 40cm) and telephotos. I have a wide angle lens and a UV filter. I take over 5000 photos per year of which very few make it to my site. Many are simple happy snaps without much thought and some have taken 100 hours to develop and compose (like Red Alert Tesla). 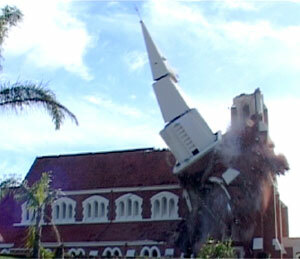 Sadly, in November 2008 it died after 18,000 shots. Probably not due to electrical interference as it wasn't shooting sparks at the time. A fabulous performance. 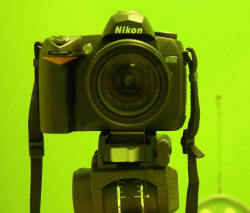 The Nikon D300 2009. 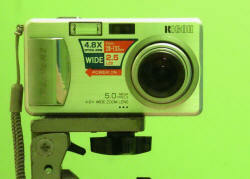 A 12 MP camera (above) replaced my D70S. Cost was AUD$2200 with 4 Gig fast Compact Flash card for the body alone (no lenses) which will store from 75 to 7000 pictures depending on the resolution. The decision to use this camera was reached for better low light performance (ISO to 6400) as well as better resolution (12 MP). Use is still familiar but with lots of new features which I have yet to fully explore but setting the autofocus point is a lot simpler and there is a live view option. Unfortunately the remote control is not built in, but the lenses I was able to use from the previous Nikon. I didn't have the hang of the white balance in the shot above. Accessories include a RF remote, and RF flash remote. I have a variety of filters including a new variable neutral density filter from 2-400, rainbow, star, UV and IR filters. I have a kit as yet not completed, to give programmed delays and triggering for the flash. Don't put a large number of very similar shots on your site. You choose the best one(s) to save others the trouble of downloading many. I use thumbnails linking to a largish size of compressed photo of 200 - 400 kb but I am very choosy with the photos and lots get discarded. I previously kept the resolution full (4 megapixel before cropping) but reduced the colour spectrum from 24 bit to 16 bit to save space. I can't tell the difference. Now I just set to 1000 pixels wide giving a typical file size of 150 k.
ARSG Asynchronous rotary spark gap. This switches the capacitors charge into the coil rapidly and frequently but not in synchrony with the mains 50 Hz. In my case the rotary disc is driven by an angle grinder motor. See SRSG. MMC multiple mini capacitors. In my case using 30 (or 60) polypropylene capacitors rated at 0.33 uF at 1600 VDC to obtain a total value of 0.044 uF (or 0.088 uF) at 24 kVDC. With this particular series of Cornel Dubilier capacitors it has been found that this DC rating can reasonably be used as the AC rating with Tesla coil use. MOT Microwave oven transformer typically rated at 250 VAC in and 2000 VAC out at perhaps up to 1000 W. Four of these are used in my supply. NST Neon sign transformer. Typical rating 250 VAC in and 12 kV AC out at 30 mA. RCD's (residual current devices) are a safety device on the mains that switch off power if more than typically 30 mA is leaked to earth to prevent electric shock. 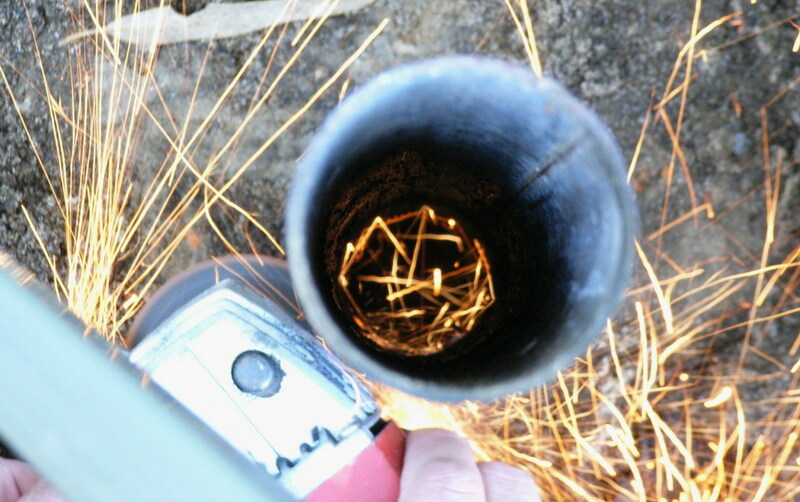 RQ (Richard Quick) static gap is a stationary spark gap for smaller Tesla coils using a number of short lengths of copper pipe nearly touching so that there are multiple small sparks in series. Originally designed by the TCBOA (?) I think. SRSG Synchronous rotary spark gap. 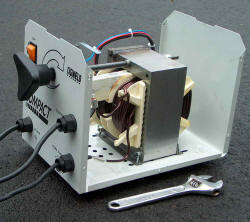 This switches the capacitors charge into the coil rapidly and frequently in synchrony with the mains 50 Hz. In my 18 inch coil this will be from a modified motor running at 3000 RPM. See ARSG. Variac A variable 'autotransformer' used in the mains circuit used to vary the mains voltage (110 in USA, 250 in Aust) from 0 to full mains voltage up to about 110 % i.e. 120 V / 270 V.
Capacitance of a two plate capacitor is C = 0.225 k A / S where C is in pF, K is the dielectric constant (air = 1), A = area of the plates in square inches and S is the spacing between plates in inches. For static gaps, LTR (larger than resonant) operation is recommended with Cp=1.6 * Cres. For SRSG rotary gaps, LTR (larger than resonant) operation is recommended with Cp=2.6 * Cres. Two people are known to have died from Tesla coils. One was a baby and one was a Boeing employee. Henry Transtrom, an experienced coiler and performance artist was thought to have died from a large TC but recent evidence from his family indicates that this is not the case. Have it 100 % safe for observers especially children with a physical barrier preferred. Make sure your rotary gap is enclosed in a near bullet proof casing. The kinetic energy of a 10 000 rpm disc shattering with electrodes is enough to penetrate mild steel sheet of the same gauge as my shed is made of. 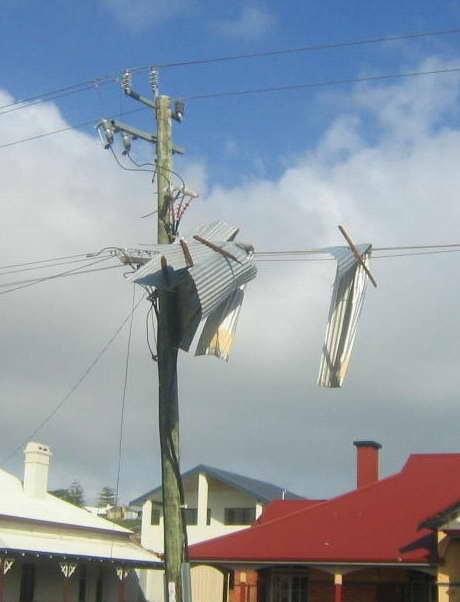 Public displays require another level of safety and (in Australia) should include a Faraday cage and various safety interlocks. Plus construction by a licensed electrician, plus public liability etc etc. Mrs Mollie Groenheide is an elderly patient of mine. She composed this poem while in the waiting room listening to people discussing my Tesla coil photo in the waiting room. Who has truly seen the light! He creates images of artistic sights. With dedicated belief to succeed. Effects real amazement by patients and visitors. To seek the incredible knowledge of the truth. Is a photo enlarged – the proof of truth. Seem captured matter as if simplistic. 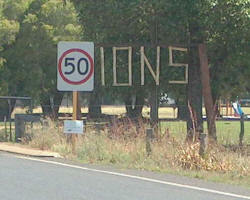 3 A sign on the outskirts of a nearby town. 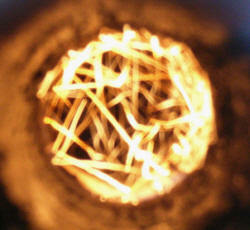 Many of my projects result in IONS - sparks, lasers etc. LIONS are a local service organization but have lost part of their "L". I am probably the only person in the world that finds this even faintly amusing. 5 A patient of mine who has a poorly controlled psychiatric disorder was heard to say to someone else in the waiting room (about me). "He's really rather weird .. " A fine commendation from a well qualified source. 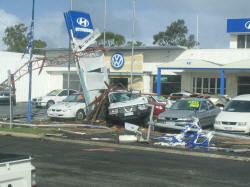 Just recently we have had a couple of tornados in my home town of Bunbury Western Australia. It was a level 3 cold weather type (I gather the US one's are warm weather types) and ran down a 10 km x 100 m path which went through a commercial district with estimates of $10 million damage. 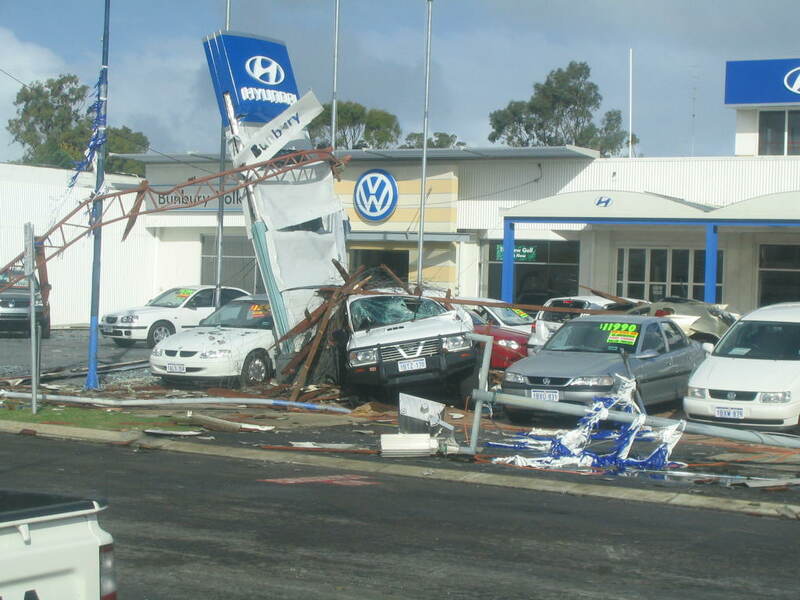 It occurred at 6:20 am and there are many stories of near misses but no-one was injured amazingly. 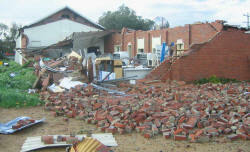 For example the train station was extensively damaged but the train had left 15 minutes before. One woman said "I thought I had won the lottery - there was a boat in my back yard!" I haven't heard from my accountant yet who keeps some of our records in his attic and he lost part of his roof. The top left photo shows one of the casualties which was the 100 year old St Patrick's cathedral. It got moved sideways a bit and was not safe structurally afterwards and is shown here being demolished in a controlled pull down with 2 inch steel ropes around the important structural members. They later pulled the church bell out of the rubble intact. 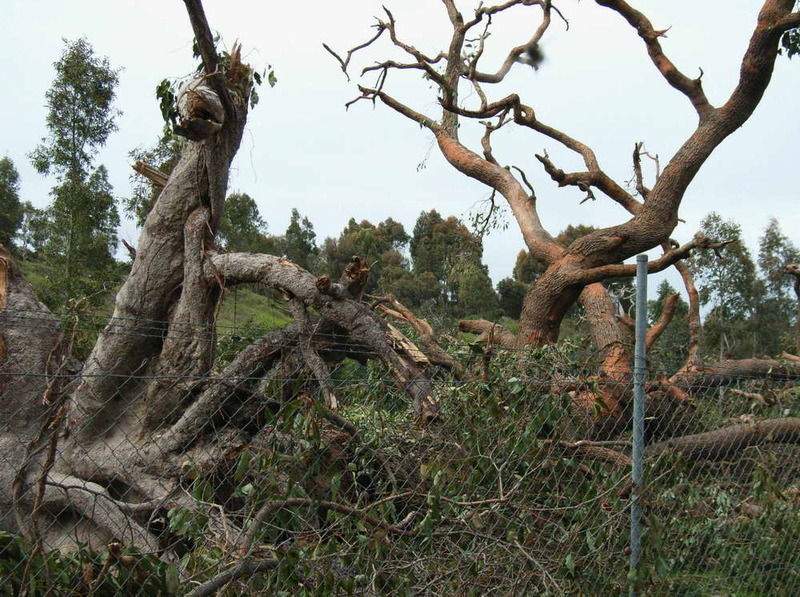 The tornado that knocked this and a number of other trees down was much more localised, perhaps 300 x 100 m but was only 500 m away from our home. The appearance of large branches stripped of leaves was typical of the previous tornado as well. The left and center photo's are of me using an angle grinder to remove an old basketball net support so I can fit a 20 ft shipping container in that place. This is to provide extra storage space. My shed interior was so full it was becoming a becoming an independent gravitational object sucking up HV related matter from around the world. It also seemed to be getting darker and was harder to get away from. I suspect some strange effect on light of intense gravity. The right photo shows the sparks from grinding the tungsten rod. Note the absence of sparkles as with iron.